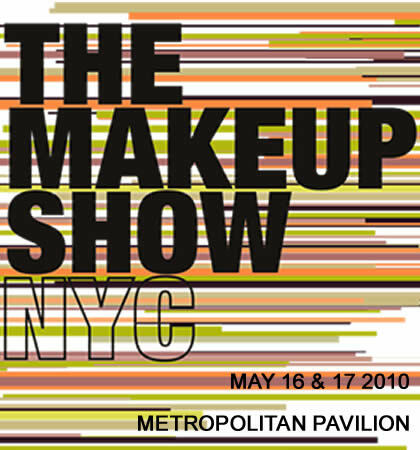 The Makeup Show NYC is excited to announce an unprecedented roster of industry leaders, under one roof in celebration of its 5-year anniversary show on May 16 & 17, 2010, 9am–6pm daily, located at Metropolitan Pavilion, 125 West 18th Street, NYC. The Makeup Show’s 2010 keynote series include famed celebrity makeup artists Charlie Green, Joanna Schlip, Tegan Taylor (Avatar), Louie Zakarian (Saturday Night Live), and a rare appearance by Make Up For Ever creator Dany Sanz. Makeup artist Charlie Green has been in the business for 20 years, prepping stars like Angelina Jolie, Milla Jovovich, Penelope Cruz, and Pamela Anderson for the red carpet to magazine covers. In “Making Up With” Green will give a first hand glimpse into the creative energy that has made her career mark on the fashion and celebrity scene. Green will reveal insider tips from working with top photographers, models, celebrities, and magazines including Vogue, Elle, GQ, and more. Louie Zakarian has helped to create some of the most memorable characters on Saturday Night Live (SNL) for over 16 years. As Department Head, Zakarian has worked with some of the biggest names in the entertainment industry. For his first The Makeup Show event, Zakarian will discuss the inner workings of SNL and demonstrate some of the key techniques and some of pop cultures most memorable parodies. Department Head for films including Avatar and Disney’s A Christmas Carol, the upcoming The Adventures of Tintin: The Secret of the Unicorn by Steven Spielberg and Robert Zemeckis’ Yellow Submarine, artist Tegan Taylor is one of the most called upon makeup artists in digital work. At The Makeup Show NYC, Taylor will talk about “The Age of Digital Makeup” from the era of digital film to the process of working in digital makeup and how it has affected her work. Taylor will discuss skills to understanding makeup application, technology, and character effects. World-renowned celebrity makeup artist Joanna Schlip will do a keynote “Red Carpet Beauty,” detailing her career and tips, tricks and techniques to long lasting makeup that is flawless in photographs, video and in person. Schlip will go beyond the basics to the secrets of what it takes to make sure her celebrity clients have beautiful and memorable occasions. Schlip is a favorite of stars like Eva Longoria, Scarlett Johansson, Jessica Simpson, and Christina Applegate. Creator and Artistic Director of Make Up For Ever, Dany Sanz makes a rare stateside appearance with 2 hands-on workshops: “Makeup Beyond Beauty” and Master Workshop “Exploring the Avant-garde”. Sanz will demonstrate the process of achieving an unmistakable character essence and present the unconventional side of fashion makeup for editorial and runway, discussing her creative process and how to develop an editing eye. Co-founded by The Powder Group and Metropolitan Events & Production in 2005, The Makeup Show NYC was created in response to the need for a professional trade event for makeup artists. The Makeup Show NYC is an annual show that has become the go-to beauty event in New York City. In 2009 it marked its place on the West Coast with the annual addition of The Makeup Show LA. The Makeup Show NYC will feature more than 60 pro-makeup industry companies including: Diamond Sponsor Make Up For Ever, Platinum Sponsors Inglot and Temptu Pro, Sponsors Crown Brush and Alcone, Lounge Sponsor Smashbox, and Media Sponsor On Makeup Magazine. Other brands include: Becca Cosmetics, Dermalogica, Embryolisse, Eve Pearl, Face Atelier, Graftobian, Iredale Mineral Cosmetics, Korres Natural Products, L’Oreal, M.A.C Cosmetics, Mai Couture, Mario Badescu Skin Care, Naked Cosmetics, Obsessive Compulsive Cosmetics, Shu Uemura, Three Custom Color, Youngblood Mineral Cosmetics, and many more! For a full list of makeup artists, exhibitors, hands-on workshops, seminars and keynote presentations, please visit www.themakeupshow.com. The Artist Summit Miami and Chicago!